Electronic ebook edition. Properly link ICD-10-PCS procedure codes to appropriate CPT procedure codes and HCPCS Level II codes. Features ICD-10-PCS procedure codes listed in numerical order, with definitions for many inpatient and outpatient codes. Download link usually emailed within 24 hours. Please Note: An email address is required for electronic fulfillment of this product. Please allow at least 24 hours for download link to be emailed after purchase. To save time, eliminate confusion, and improve coding proficiency, turn to the Procedural Cross Coder. 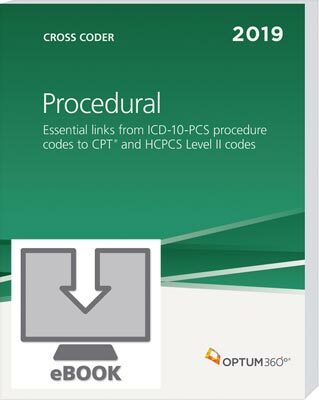 An ideal resource for inpatient facility coding, this all-in-one resource crosswalks ICD-10-PCS procedure codes to CPT® and HCPCS Level II codes, allowing the user to analyze data across coding systems. ICD-10-PCS codes listed in numeric order. ICD-10-PCS procedure codes are listed in the same numeric order sequence as your ICD-10-PCS manual to make searching quick and easy. Increase coding efficiency using just one resource. Complete claims requiring ICD-10-PCS procedure codes, CPT® and HCPCS Level II codes using the same resource. Find answers quickly. The glossary supplies definitions for common clinical, billing and reimbursement terminology. There are no product reviews at this time. Be the first to review this product.